Gay Morocco: This wonderful gay group trip explores some of Morocco’s most fascinating places. You will start in Casablanca which is Morocco’s largest city. You will then head to Fes which is also known as the symbolic heart of Morocco. You will then stop at Erfoud before heading to the Merzouga Dunes where you will spend a night camping under the stars. Your 11-night trip will be filled with incredible Moroccan food, camels and culture. You will start in Casablanca, which is a port city hugging the Atlantic Ocean. It is known for being the country’s economic and cultural capital. You will be met at the airport by your driver who will transfer you to your city hotel. You will have some time to freshen up and prepare for a welcome dinner. If you are on a morning flight, you can tour the historic port of Casablanca or visit the world’s tallest minaret at Morocco’s largest mosque, King Hassan II Mosque. After breakfast, you will take a scenic route to Fes. You will pass through an agricultural and forested part of this country – quite a contrast to the arid mountain passes and deserts that we will see later in our journey. Before you reach Fes, you will pass Rabat which is the home of today’s king, and the ancient city of Meknes. We’ll make a stop at the holy city of Moulay Idriss, a picturesque little town that is a national pilgrimage site (it holds the tomb of the holy saint Moulay Idriss). After you will visit Volubilis or “Oualilli” as it is known by the Berber. Volubilis is known for being one of the preserved Roman towns in North Africa. It was once the home of Cleopatra’s daughter. Fes (also spelt Fez) is the oldest of the imperial cities and arguably the symbolic heart of Morocco. You’ll spend the day touring around and exploring the city taking in its unique culture and atmosphere. After a long day exploring this marvellous city, we will return to the hotel for relaxation and prepare for our next day’s adventure. After breakfast in the hotel in Fes, you will head up the cedar-covered slopes of the Middle Atlas Mountains to Imouzzer, dominating the plain of the River Sebou. You will continue past the hill station of Ifrane, the town of Azrou with its old kasbah and handicraft centre, the pass of Zad and the town of Midelt, a centre of lead mining. Continuing from Midelt we will pass through the awe-inspiring Tizi N’Talghemt Pass, then along the Gorges of the Ziz River to Errachidia, a garrison town where we will have a stop for lunch. Our destination today is the picturesque oasis of Erfoud, situated among the impressive sand dunes of the Sahara Desert. We’ll depart Erfoud in rugged 4×4 Land Cruisers, the only vehicles that can safely traverse the sand drifts and pebbles of the desert. Our first stop is at the nearby village of Rissani, once home to the African/Berber trading market. We’ll visit the village of Merzouga. at the base of two prominent Sahara sand dunes reaching over 450 feet high and stretching 15 miles. The changing colour of the dunes is fascinating to watch. For the bird lovers out there, here is the best place to spot some of the countries desert bird. From Merzouga, you will take a camel ride along the dunes. Tonight we stay in a permanent Bedouin encampment of comfortable camel-skin tents. Marvel at the sunset before an amazing show of stars under the desert sky. Start your day with the spectacular sunrise at dawn. After breakfast, you will hop back on your camel and head back to Merzouga and by Land Cruiser to Erfoud. We soon head west from Erfoud and the relatively flat desert landscape gradually changes as we approach the foothills of the southern slopes of the High Atlas Mountains. Over the next two days, immerse yourself in the raw beauty of the Todra and Dades Gorges that nature has carved from these slopes over the millennia. You will spend two nights in a Kasbah-style hotel overlooking the mile-high main town of the gorges, Boumalne-Dades. This will give us a chance to slow down for a leisurely exploration of the area, and perhaps a visit to the hotel’s spa or outdoor pool. From Boumalne we continue west along the Dades River. We will pass through the Skoura Oasis, and pause to explore Kasbah Amridil. This is a traditional Kasbah which has been well-preserved (and used as a movie set), and it’s open for visitors to get a better idea of the intricacies of Kasbah living. 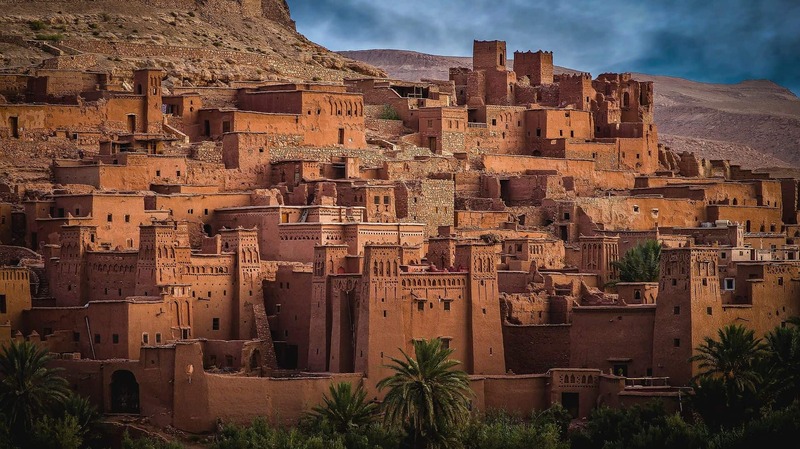 Ouarzazate stands in the middle of an arid plateau that contrasts sharply with the rich vegetation of the nearby slopes of the High Atlas Mountains. The market is renowned for its fine pottery and magnificent carpets woven by local tribes, so this will be a good opportunity to make purchases of typically Moroccan products. The city’s two most famous man-made locations are the outdoor movie studio where movies such as Cleopatra were filmed, and one of Morocco’s most famous Kasbahs, the 11th Century Ait Ben Haddou – location for some of the scenes of Lawrence of Arabia! Our Moroccan riad-style hotel for the night is an oasis of green close by the UNESCO World Heritage Site of Ait Ben Haddou, allowing us to feel the ambience and tradition of hospitality that has greeted passing desert travellers over the centuries. From Ait Ben Haddou we drive north over the Tizi-n-Tichka Pass (6666 feet) in the direction of Marrakech, with views of adobe homes and Kasbahs. As we descend to the fertile Haouz Plain we will see red clay villages and greenery, in contrast to the infinite shades of brown on the desert side of the High Atlas Mountains. Rising up from the plain is Marrakech – Morocco’s fourth imperial city. Marrakech is known as The Pearl of the South, and it is a truly magical place, magnificently situated in an oasis, with the High Atlas Mountains as a backdrop. During today’s tour of Marrakech we’ll inspect the most beautiful of the city’s gates, the ancient Bab Aguenau; the fabulous 19th Century Bahia Palace, with its Moorish gardens and Andalucian decorations; and the picturesque Koutoubia mosque. If we have time, we’ll drive to the delightful Majorelle Garden with its luxuriant subtropical vegetation and Museum of Islamic Art, created in the 1920s, but restored by Yves Saint-Laurent. One of the greatest delights of being in Marrakech is to stroll through its souks. There we can see leather workers, shoemakers, dyers, brass-smiths, spice merchants and antique dealers in their working quarters and shops. We’ll wander around the legendary Djemaa al F’na Square which is always filled with entertainers, medicine-men, musicians, dancers, acrobats, jugglers, storytellers, soothsayers and snake charmers. Marrakech features a wide variety of restaurants, ranging from sidewalk cafés ideal for people-watching, to restaurants housed in traditional Marrakech mansions. Tonight, we will have our farewell dinner together, and perhaps savour typical Moroccan cuisine such as couscous, harira, tagine and pastilla. The final day we round of this amazing gay group trip by transferring you to the airport where you will catch a flight to your next destination.